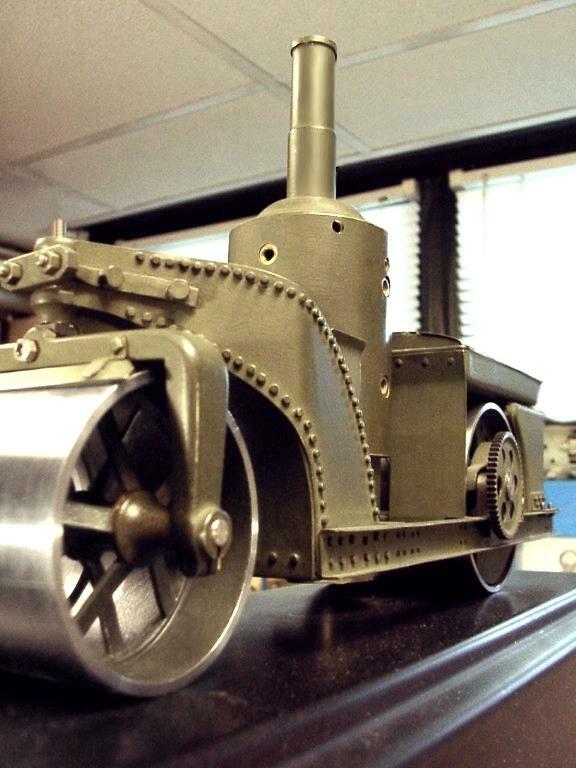 The prototype holds a special appeal for me, as the little 5-ton roller served our town as the city's only steamroller in the 1950's when I was growing up. I remember fondly the clanking sounds coming from two blocks down the street, as the proud old machine inched its way up past our house, and on to its latest job. Even viewed from a distance, it had a somewhat menacing look, appearing ever-larger as it approached, black smoke issuing from the tall stack. As kids, I think we were even a bit scared of the thing, as it "chased" us on our bicycles. Little did we know it was just a tired old riveted-steel senior citizen, trying to earn its keep in a world of road rollers rapidly becoming dominated by new gasoline and diesel goaliaths, ready to take over at the first signs of any weakness. The last job the poor old thing ever did was to pave the asphalt walkways in our city's main park in 1967. Well, I guess this is a bit of a departure - a "rough-and-ready" little model, but perhaps it best reflects the true nature of the prototype - basic but functional. These machines, like their operators, worked tirelessly on long shifts and in high temperatures, so the rest of us could enjoy motoring along our streets and roads to reach our destinations in comfort. The model is made from steel sheet, formed to shape, except for the mutlitubular boiler, which is silver-soldered copper. The boiler shell is insulated and cased with thin brass sheet, while the rolls were turned from steel pipe. The model is 11 1/2" long by 8" tall to the top of the stack and is seen here sitting on top of the belt guard of my eight-inch drill press. Construction began on this machine in the early nineties, but the work subsided while I considered the design of the engine. The original was powered by a horizontal double-acting twin cylinder engine of the single expansion type. 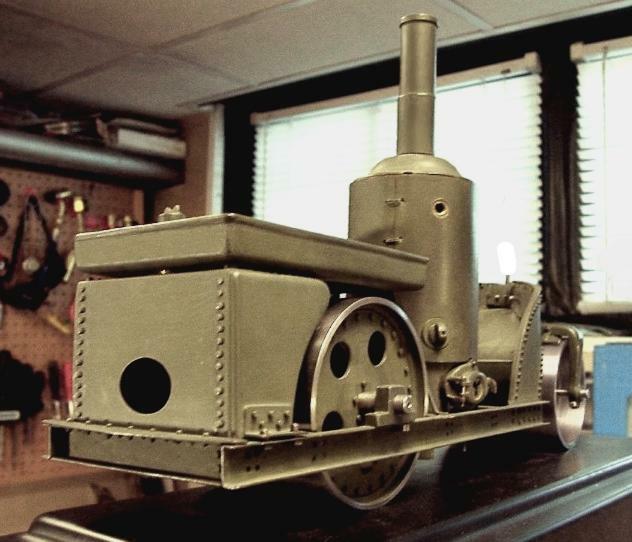 In this model, the entire engine will need to be no more than 2 1/4" in overall length. There is much work on this project yet to be completed - no start has been made on the engine, burner, or steering gear and one of the rear steering rolls is yet unspoked. More progress on this web page will reflect any new action on these fronts. This shot is a bit fuzzy, due to limited depth-of-field, but I am including it anyway as it gives a good feel for the size of the prototype. Nobody looks perfect after eighty-five years! This is the prototype. It was made in Springfield, Ohio and was completed on June 28, 1919. Fresh from the factory, it was delivered in Brewster Green, a popular color originally developed by the Brewster Carriage Company from Connecticut and New York City. Brewster Green continued to be used on automobiles until recent times. 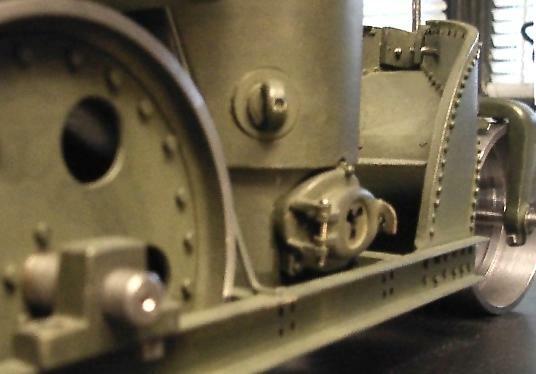 The color of the undercoat on the model is considerably lighter than the original Brewster Green. The original paint survived on this old Kelly Springfield until after retirement in 1967. The roller has a horizontal two cylinder engine. Early Buffalo tandems's had side-mounted vertical engines, causing a rocking motion leading to a wavy quality of the surface being prepared. This generated a false impression among roadbuilders that all tandem rollers performed in this manner. This unit was not equipped with a governor, but has steam-powered steering. A vane-type rotary steam engine is coupled by roller chain to the main pinion shaft, which engages a large sector gear on the steering pivot of the back roll. The operator steers the machine by a small lever on a bi-directional valve, located directly in front of his seated position. The back "roll" is actually two rolls, side-by-side, acting like an automobile diferential gear to enable smooth turns. 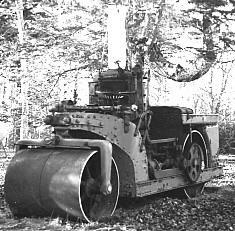 Classic American Steamrollers 1871-1935 Photo Archive by Judge Raymond L. Drake and Dr. Robert T. Rhode. The reviews on this book are excellent, it covers all the recognized manufacturers of this type of equipment in the United States and Canada and the authors know their subject intimately. All rights reserved. (c) 2004 John R. Bentley.